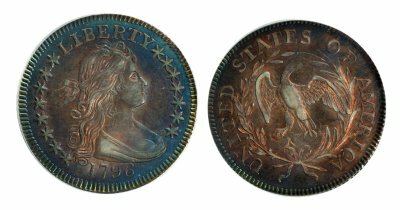 (Huntington Beach, CA) – Described as a “once-in-a-decade collection,” an East Coast collector’s set of high-grade 18th century United States coins has been purchased for $2 million by Premium Numismatics, Inc. of Huntington Beach, California. “The set of 41 coins, many with famous pedigrees such as Eliasberg, Norweb, Garrett and Pittman, represents an example of every date and variety of United States Mint regular issue copper and silver coin from 1793 to 1800. Many of them are in uncirculated grade,” said Don Willis, President of Premium Numismatics. “This truly is a once-in-a-decade collection. It took the collector ten years to assemble the set, and you usually don’t see a collection of this caliber become available except every decade or so. Collections of this magnitude rarely come to market,” said Willis. The name of the Florida collector was not revealed. The cash sale was made through Legend Numismatics of Lincroft, New Jersey which purchased the collection, then sold it to Willis. 1799⁄8 Dollar, 15 Stars Reverse B-3, BB-141, PCGS MS-62, “beautifully toned in fiery blue-greens and amber,” according to Willis. Willis acquired the collection a few days before the Long Beach Coin, Stamp & Collectibles Expo, and informally displayed the coins during the recent show, June 1 – 3, 2006. “The extraordinary response from collectors and dealers in Long Beach was gratifying. It was a pleasure to share these coins with an appreciative audience before they find new homes and perhaps are be put away for another decade,” said Willis. High-resolution images of the coins now are posted on the company’s web site, www.PremiumNumismatics.com.